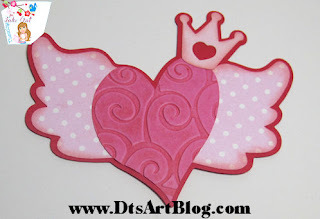 The winged heart is going to add lots of fun whimsy to many of your projects. It's cute, funky and fun winged heart with a crown on top. I provide Tuesday Take Out as a thank you to my followers and regulars. It is available on Tuesdays and Wednesdays for download on Thursday we throw out the leftovers. If you are not already a follower you should consider becoming one so you don't miss any more Take Out Tuesdays. Still really want the file, read about file request. If not then, please join us next Tuesday when Fresh Take Out will be posted. Be sure to become a follower so you will not miss anymore Take Out Tuesday Freebies. Take Out is posted for my followers to download on Tuesday and Wednesday, on Thursday we throw out the left overs. Hi Dandi Crafters! Whew! Whoo! 400 Followers. Thank you to all my followers and regular visitors. Your following me has kept me posting my Take Out Tuesdays. Today's download is a sweet little fairy tale inspired frame. 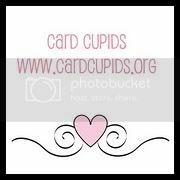 I am sure that you will find many fun uses for this die cut, enjoy it. 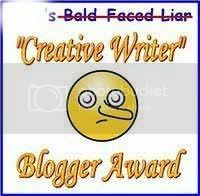 Thank you all so much for visiting my blog and your encouraging comments. I appreciate every single one. Now here is to a quick jump to 500 followers. At 500 followers I will not only make all Take Out Tuesday available from the this period but last periods too. I am rough estimating that will be around 40-45ish svg available for download. You won't want to miss that, so stay tuned. Hi Dandi Crafters! 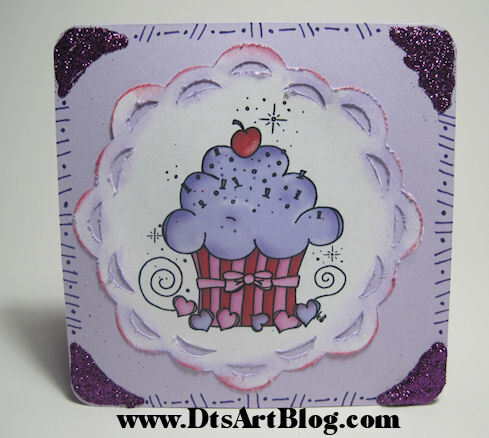 I made this yummy sweet card for The Stamping Boutique Design Team Challenge Blog. 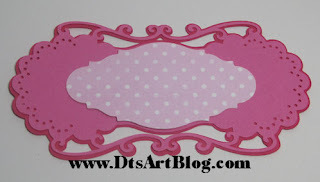 The Stamping Boutique is sponsoring Critter Sketch Challenge Blog. The point of this challenge is to use a circle and distressing. 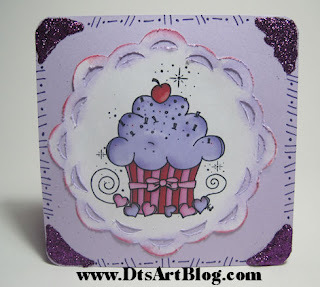 For this challenge I used this darling cupcake by The Stamping Boutique. Printed it out and then used my MTC software, to cut it out in a funky scallop circle then distressed it . I also used MTC to cut out a little rounded corner card. I got out my glitter and added to each of the corners to give it a bit of a framed look and draw more attention to the middle. 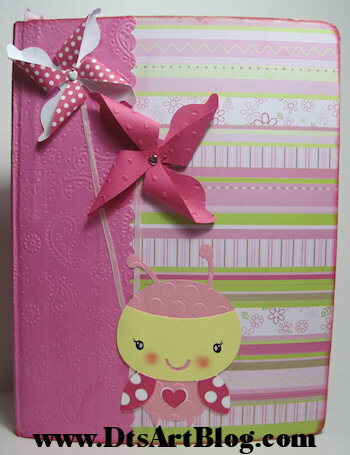 the cupcake wrapper is striped and I added lots of dots to the edges of the card. Cupcake Craft Challenge - Food for Thought -food, drink and diets are fresh in everyone’s minds. So we’d like to see your projects incorporating this. Hi Dandi Crafters. It is that time again when the follower clicker is about to come around to double zeros. You know what that means, it mean a thank you file! So look for it soon. You'll want to keep your eye on the follower counter for a bit longer too because at 500 followers all Take Out Tuesday files will become available again so if you missed any you can catch up. 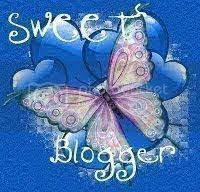 I appreciate you visiting my blog, and Take Out Tuesdays are my way of saying thank you for being a regular and/or a follower. Take Out Tuesday downloads are only available on Tuesday and Wednesday. On Thursday we throw out the leftovers. If you do not follow me consider doing so, so you won't miss any more Take Out Tuesday Downloads. Another Thank You and More Winning!! Hi Dandi Crafters! 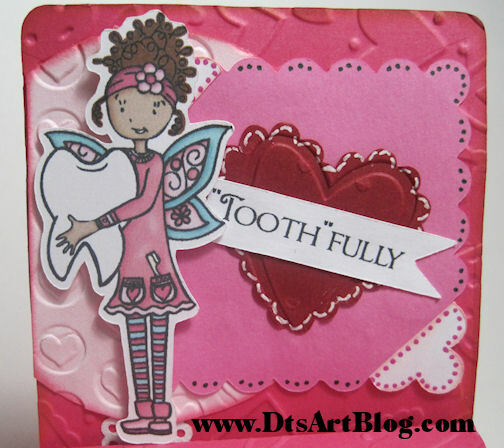 Last week, on my maiden project as a TSB Design Team Member, I entered my "Tooth"fully Valentine that I did for The Stamping Boutique Design Team Challenge Blog in a challenge over at wags n' whiskers challenge blog. Well I was picked by random draw to win a rubber stamp from Stamp and Create. There were so many wonderful stamps to pick from. I finally was able to compose myself and I chose Angelica by Wags 'n Whiskers. It was quite hard to pick there were so many that I wanted. 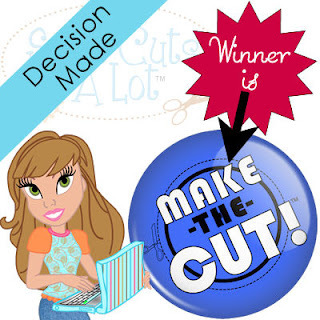 Well if that wasn't enough, I find out that when you win a challenge as part of the TSB Design Team using one of Tracey's darling images you get to pick a digi stamp from The Stamping Boutique. Wow! am I on a roll or WHAT!!??!! So I chose Twirling Fairy. I can't believe the luck I am having winning all these wonderful items! I just wanted to thank everyone properly I am so grateful to have won! A Thank You and I WON!! Hi Dandi Crafters! 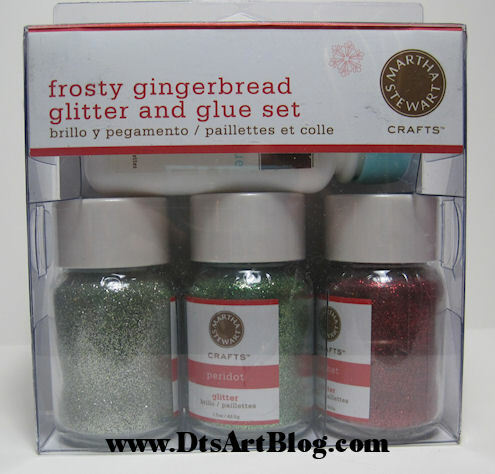 I just wanted to take a minute and say THANK YOU to the Fantabulous Cricut Challenge Blog and Scrapbook.com for the yummy Martha Stewart Frosty Gingerbread Glitter and Glue Set. Many of you may have remembered me posting my Jolly Holiday Santa Letter. I entered the Santa Letters in the Fantabulous Deck the Hall Cricut Crawl. I was picked from a random drawing and WON the fantastic prize you see above!! I am very excited. If you haven't entered the Fantabulous Cricut Challenge you really should. 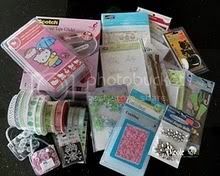 It is really fun and they have wonderful sponsors like Scrapbook.com giving away Fantabulous Prizes! Hi Dandi Crafters! 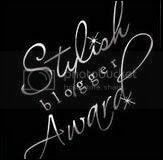 Today I have designed this little tag for The Stamping Boutique Design Team Challenge Blog. 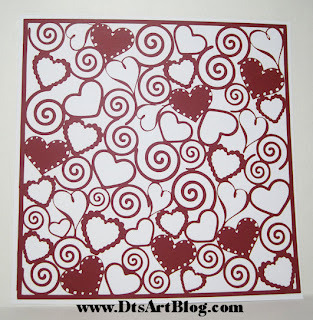 The Stamping Boutique is sponsoring Critter Sketch Challenge Blog. The point of this challenge is to use blue and sliver and accent with either rhinestones or pearls. For this challenge I used Twirling Fairy by The Stamping Boutique. I played with my MTC software, print and cut some more. I am having such a blast with MTC. Lately I have been in a real fairy mood. I am all about some fairies lately! LOL I used some aluminum foil over card stock to create the outer most tag. I love that effect. I also used my Cricut to cut out Believe. I think it turned out really cute. 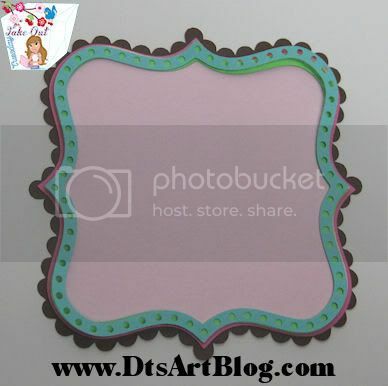 Simply Create - Use Your Punches,"grab your punches, nestie, or die cuts and join in on the fun"
Hi Dandi Crafters! Happy Take Out Tuesday to you. Did you see my post yesterday "Tooth"fully Valentine? Isn't that just a super cute Valentine? Well that is today's Take Out Tuesday. My daughter told me last week that she wanted to "make her valentine's this year" which means, Mom come up with a project that is simple enough for me to do and give to my friends. There is also the IMPLIED candy included. LOL This is what I came up with. I personally prefer to be able to make valentines and then decide what treat to include. This is the perfect box for it. I can include 2 or 3 fun size candy bars, M&M's, Hershey Kisses, a couple boxes of nerds, whatever I am in the mood to buy when I go to the store. It also has a 3.25 by 3.25 inch card area for my daughter to decorate. We can cut out some Cricut cuts and she can let her creativity take over. I thought some other busy Moms might find this file useful for Valentine's Day too so I am making it available for download. The cute little tooth fairy digi stamp that I used to decorate this box is available for purchase from The Stamping Boutique. Be sure to check it out. 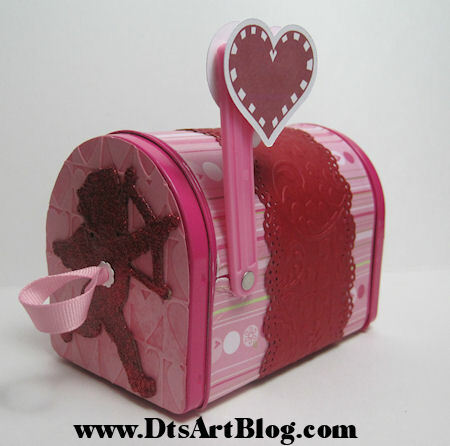 The assembled Valentine box as you see it here is 5.25 inches tall by 3.25 wide 1.5 inches thick. The valentine box cut out is just under 8 inches wide and 11 inches in height. 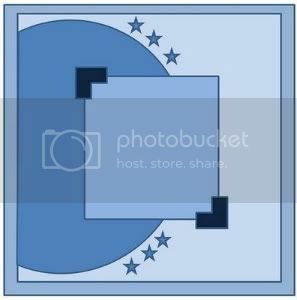 It DOES fit on a standard 8.5 x 11 inch paper and card stock but JUST you do have to pay close attention to where you place the paper and where the cut is going to start and stop. LOL. 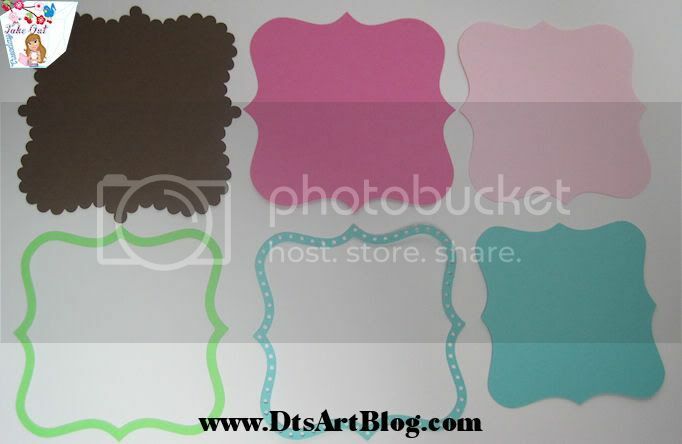 Hi Dandi Crafters Check out this blog candy giveway. Hi Dandi Crafters! Check out this blog candy giveaway. Wow! Check out this giveaway! Hi Dandi Crafters! 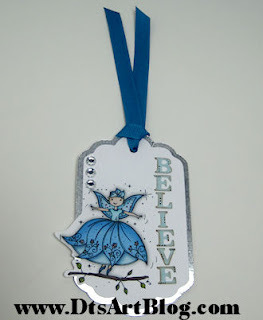 It is a new year and I am a new member of the The Stamping Boutique Design Team Challenge Blog. 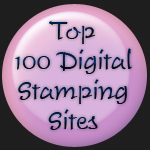 The Stamping Boutique is sponsoring 2 different challenge blogs, Kaboodles Doodles Challenge Blog; where you can use any digi image you like, and Critter Sketch Challenge Blog. The sketch for this challenge is shown below. 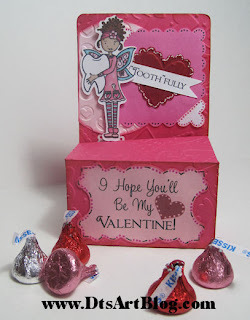 For both of these challenges I used Tooth Fairy Cynthia from the Fairy Cynthia Line by The Stamping Boutique. It was so much fun creating this valentine. 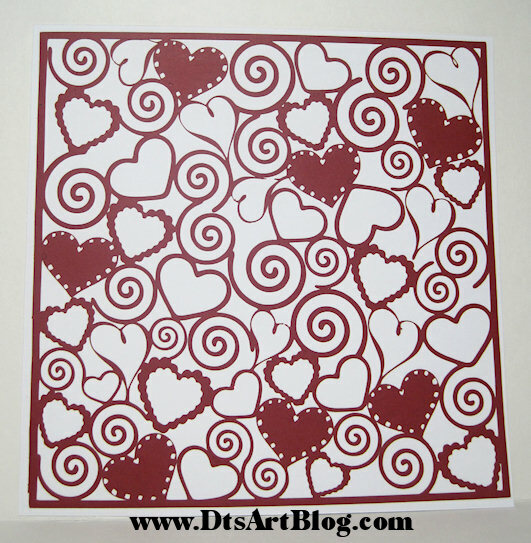 I just purchased a couple of new Valentine Sizzix Texture Embossing folders, Love Set and Valentine Set#4. I was very excited because I am never at the craft store when they put out a brand new item. LOL it is the little things in life LOL. On this valentine I also got to use a new technique with my MTC software, print and cut. That is how I got the cute sticker effect around the Cynthia Tooth Fairy. I really like the sticker look for stamps it is just so fun. The valentine box was something I designed because my daughter likes to give valentines that also incorporate candy...LOL who doesn't! Hi Dandi Crafters! This months challenge over at Sugar Sweet Paper Treats, Deborah issued the challenge to "Alter Something" alter something besides a card or a layout. What a great challenge! I altered a tin mini mailbox that I picked up from target. It super fun and pretty easy to do. 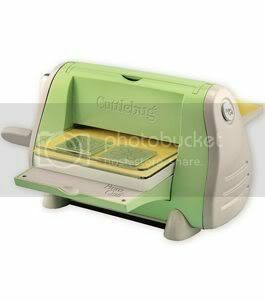 Look what the lucky winner of this challenge will get, Cricut Cartridge French Manor! Whew Whoo!! Now isn't that just super! You have until the end of January to enter, so get to altering and pop over and enter! Hi Dandi Crafters! Happy Take Out Tuesday and Happy New Year. I hope everyone has a wonderful and blessed 2011. I wanted to get the new year started off right so I have an especially CUTE SVG file to share today. 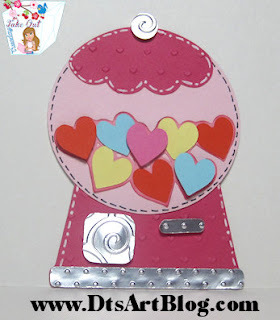 A Gumball Machine with little heart gumballs. How cute will this look on all your Valentines? Download: Download: No longer available. Please join us next Tuesday when Fresh Take Out will be posted. Be sure to become a follower so you will not miss anymore Take Out Tuesday Freebies. Take Out is posted for my followers to download on Tuesday and Wednesday, on Thursday we throw out the left overs. •No experience necessary but you must have a love for the craft! So my entry is an altered Composition Notebook. My daughter needed a new one, she loved the last one I made her and used it to pieces so it was time for a new one. I love the Create A Critter Cricut Cartridge. It is beyond cute. She liked the ladybug. I made her a bookmark before using the ladybug and she loved it so I decided the ladybug would be on the front. I learned from the last Composition Notebook that she needed pockets on the inside. She is alway writing, drawing, doodling, ect. and sticking them down inside. So I made sure to add pockets this time, which of course made more room to add more cute little embellishments. 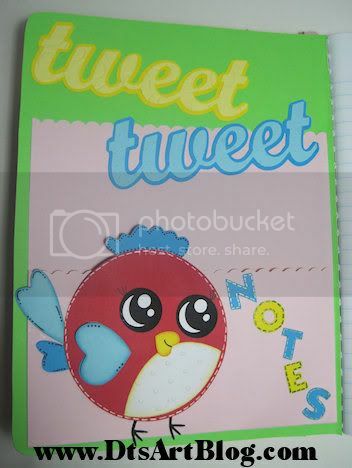 Here is a look at the inside pocket where my daughter will put her tweet, tweet notes. You might recognize red bird from last weeks Take Out Tuesday's download. Here is the back pocket. I knew I wanted to use the pig from Create A Critter, but I needed a pithy little saying to be able to use it so it would have a cute saying like the front pocket's tweet, tweet notes. It took me awhile but then it came to me, epigrams. PERFECT!! 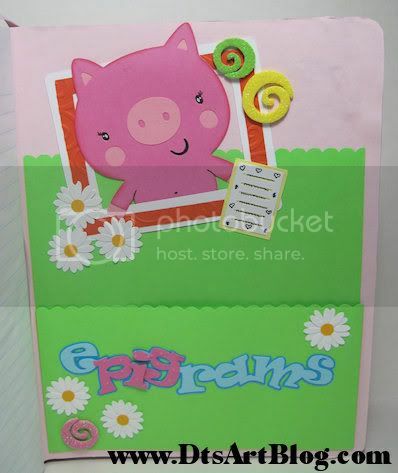 You know the "pig" in epigrams screamed out to be cut in pink. Husband got real sick of hearing how clever I thought I was to come up with that, but my daughter thought that it was super cute too. See the litttle pig in the frame, he is holding his own little epigram...but you can't read it because it is in pig latin....LOL, hehehe, see what my husband and family have to put up with on a daily bases. LOL! One last little note about the pockets. They are cut at 8 inches wide by 10.5 inches tall. On the 10.5 inch score at 7 inches. Then on the 8 inch side cut a 1/2 inch off both sides until you get to the 7 inch score lines. Stop cutting at the 7 inch score lines. Score the flap that now sticks out at either side and glue. You now have your pocket for the inside, that was EASY PEASY!! Sure Cuts Alot Vs Make The Cut Decision MADE!! Hi Dandi Crafters! Happy New Year! A while back I posted about needing to upgrade my Sure Cuts Alot version 1 to a more updated program. I asked you my readers what you thought and which you used. I was pleased that so many took time to help me out and post. It really helped me make the decision! I upgraded to MAKE THE CUT!! YEA!!!! I guess the main reason I went with this program is the print and cut capability that Make The Cut offers. It was a real adventure purchasing MTC, however. When I went to purchase it from the site, it applied tax which although was not advertise I was OK with. Then when I went to check out it applied the tax AGAIN!! I tried purchasing from the site directly and like 3 different affiliate sites too. I finally ended up purchasing from scrappydew.com. Rob helped me with the glitch on the website REALLY FAST. He also gives you a starter pack of SVG files to get you started too. Which is very cool. I have been too busy to look at them yet but just the fact that you get a little something extra is cool. So in the next foreseeable future Take Out Tuesday downloads will not change, they will be available as they have always been in SVG format and SCAL 1 scut format. I am sure that will change as I learn my way around and end up preferring Make The Cut more and more. Thanks for everyone who stopped by to help me make the decision. I am really happy with my purchase.